Do you know what naan is? If you do your mouth is probably watering just thinking about it (or at least mine always does). If you don't know what it is you have me to forever thank for introducing it to you. Naan is basically the Indian version of a tortilla but it has yeast in it. It's also has more dough and is just sooooo good! I first ate amazing naan when I lived in Korea. By ate I mean when Alisha and I had a bad day we would sometimes walk 2+ miles just to eat some naan. It's amazing stuff. I can buy it here in the frozen section of the grocery store but I knew I could make it too. 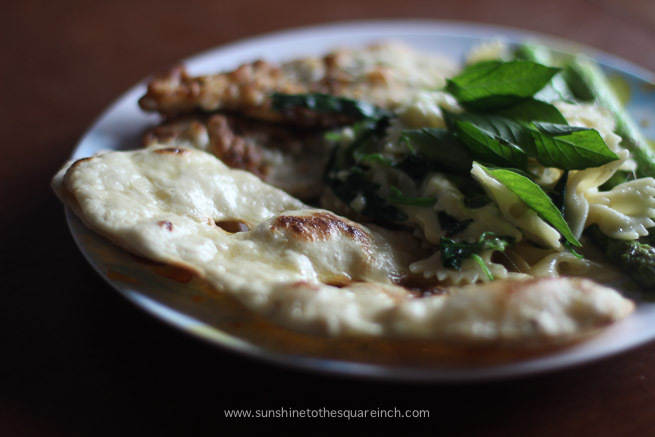 Naan really is supposed to be made with yogurt and milk but that isn't always easy to come by here so I searched high and low for naan recipes that don't use those ingredients and I came across the perfect one. Something else I love about naan is that you can make a big huge batch, cook it and freeze it. It is a great snack after a long day at school! 1. Mix the water and yeast together until the yeast is mostly dissolved. 2. Stir in the flour until mixed. 3. Cover and place in a warm place for 30 minutes. I place mine near the stove. 4. On a floured surface roll out pieces of dough to whatever shape and size you like. Cook them on a stove over medium-high heat until golden brown. Mine are various shapes because a rolling pin here costs $25 (and I refuse to pay that) so I roll them by hand. 5. Right after you remove them from the stove slather them with an unhealthy amount of butter, sprinkle with salt and add some garlic if you like. 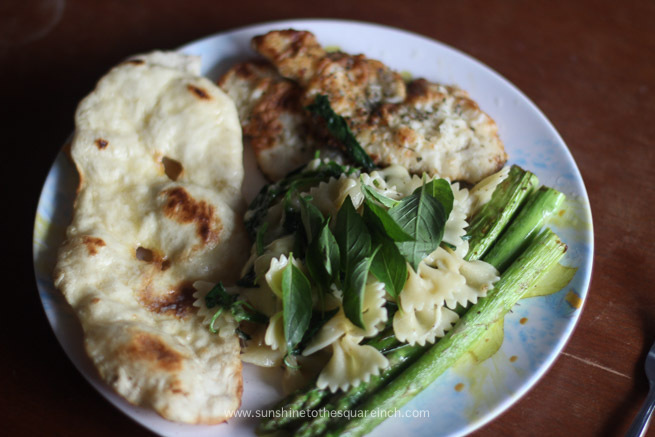 You can also sprinkle some cilantro on there too or any other herb you love. If you want to freeze these cook them first but do not butter or salt them. Let them cool completely and then just put them in a freezer bag. To reheat them I just place them in my toaster oven for a couple of minutes. You could also broil them in your oven for a quick reheating. I haven't tried a microwave because I don't own one here in Asia. Easy peasy friends! If you try these out let me know what you think. Have you ever had naan? Do you make big batches of things and freeze them? I've never ever made naan at home...and we're so lucky there's shops that sell naan fresh from the tandoori oven all over the place here. Actually, back when we first moved to Malaysia when I was a kid, tortillas weren't sold here, so we would buy chapatti from the lady at market who made them--they don't have any yeast and are even closer to a tortilla, and make burritos with them at home since we missed Mexican food, haha! I had no idea it was so easy to make! I never realized it was that easy! 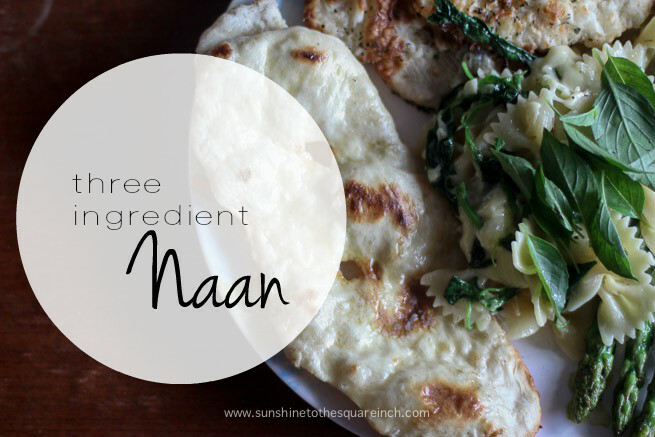 I'm totally going to try this because I LOVE naan and they are darn expensive at the store! Pinning right now and I even might make it this morning because I already have all the ingredients!